This 2.1 kilometre track is considered one of the best walks to be found in the Grampians, so be sure to arrange a visit! It’s categorised as easy-medium, but it can be quite steep at times. To reach The Pinnacle, start at the Sundial carpark to easily make your way there. With some of the most spectacular views of the region, The Balconies Lookout is not to be missed. Beginning at the Reed’s Lookout carpark, it’s about a 2 kilometre walk to reach the top. 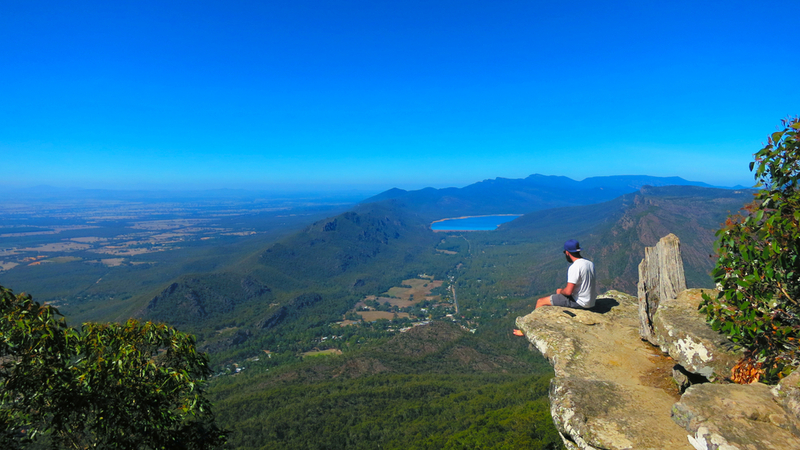 Make your way through the beautiful stringybark forests and rocky formations of the Grampians and take a well deserved rest in front of the breathtaking lookout. As one of the most renowned tourist destinations of the area, Mt William stands at an incredible 1,168 metres high and offers some amazing views of the entire mountain range, as well as its surroundings. With its view of sprawling farmlands, charming townships and dense vegetation, it’s no wonder this beautiful mountain peak is immensely popular. This lookout can be reached via Mt Difficult Road, and boasts a stunning, 180 degree view of Western Victoria. From here, you can see Lake Bellfield, Halls Gap and beyond. There are also picnic facilities and toilets available, so it makes for a perfect pit stop on your journey. Are you an experienced walker looking for a challenge? Look no further than Mount Surgeon. With its open woodlands, rocky terrain and water crossings, this track is sure to be an adventure. When you reach the summit, there are incredible, panoramic views of the surrounding ranges and volcanic plains, as well as the town of Dunkeld. For a stress-free day trip, Melbourne On The Move run day tours to the Grampians so you too can take in the majestic scenery of the region. To learn more about the range of day tours we offer, please don’t hesitate to get in touch with us on 1300 558 686.